Welcome to the Spotlight on Student Learning, the District’s monthly electronic newsletter. Each edition of this year’s Spotlight will have a different theme, and this month’s theme concerns the use of instructional technology across the District to support our educational programs. Connecting students with content. Many textbooks are outdated by the time they are published. To access robust and timely content, our students use the internet in class and at home. This ready access to information and resources has already transformed our educational programs. For example, 8th grade English and History teacher Annie Holland describes her classes this year with 1-to-1 access as just that — “transformational.” She can guide her students to databases of primary source material, and work on research and writing skills in class. Time previously spent going to a computer lab and waiting for a turn on the computer is now applied to learning. Her classes are engaging with richer content, using their time more efficiently, and covering more material than ever before. Promoting collaboration. The new Common Core standards emphasize collaboration as an essential skill for both higher education and careers, and research has shown that collaboration can enhance the development of critical-thinking and problem-solving skills. Piedmont’s adoption of Google Apps for Education and chromebooks as a common learning platform has made it possible for collaboration to flourish! Students and teachers alike work together on research, documents, problem solving, and presentations. Collaboration can take place synchronously or asynchronously, physically or virtually, similar to the range of collaboration styles used in today’s workforce. Connecting school and home with access to learning. Though many Piedmont households have internet-accessible devices, research suggests that more than 70% of Piedmont middle school students and 65% of high school students share computing devices at home. By providing a chromebook to each student, the Connected Learning initiative is consistent with the nation’s technology education plan, which calls for each student to have at least one internet access device — with appropriate software and resources for research, communication, multimedia content creation, and collaboration — for use in and out of school. 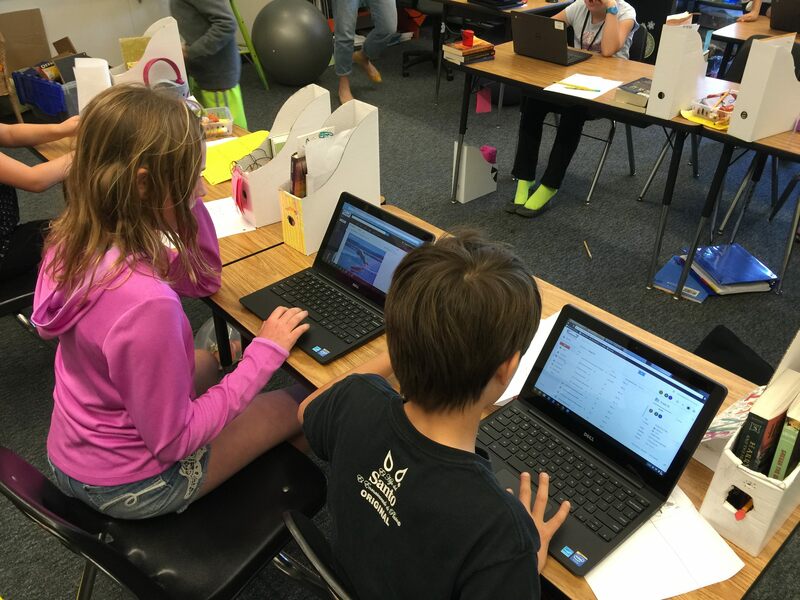 The articles that follow illustrate how Piedmont Unified’s Connected Learning initiative is maximizing the benefits of technology to enhance learning opportunities for ALL learners. Educator Debbi Hill champions Membean, the adaptive and personalized vocabulary-building program for elementary and middle school students. Director of Instructional Technology Stephanie Griffin describes how many elementary classes are use Newsela to differentiate the study of current events for students at different reading levels. The profile of PMS Science teacher Logan Medina explains how the PMS Science Team is using new measurement devices and other tech tools that record highly accurate data to support labs and implementation of the new Science curriculum standards. Students with diverse learning needs, including but not limited to English language learners, students who are gifted and talented, students with special needs, and students from different cultural and linguistic backgrounds, share these powerful and flexible learning tools. Educators can use these tools to expand and enhance course content, incorporate digital literacy across disciplines, and differentiate instruction. So please read on! If you have questions or comments about instructional technology, please contact your student’s teacher or site principal, or Stephanie Griffin, the District’s Director of Instructional Technology, at sgriffin@piedmont.k12.ca.us I welcome your questions and comments at any time, so please don’t hesitate to contact me at rbooker@piedmont.k12.ca.us.